The National Recovery Plan, which aims to restore order to the public finances and boost competitiveness, has been published by the Government. 22.22 UCD economist and An Bord Snip Nua author Colm McCarthy said that people speculating on Ireland's debt were incompetent with their figures. He said some media contributors on other programmes had been careless in the figures which they had supplied with regard to Ireland's debt. 22.17 ICTU Assistant General Secretary Sally Anne Kinahan said the plan is a betrayal of low and middle income earners. She said it would not contribute to job creation. 22.11 Fine Gael Finance Spokesperson Michael Noonan has reaffirmed that his party is against a reduction in the minimum wage. He said it would have no real practical effect on the economy. 22.04 Mr Lenihan said that the burden of the plan had been put most on people who could afford to pay it. 21.59 Minister for Finance Brian Lenihan has said the Government had prioritised what resources the Government had in social welfare. He said rate changes may have to be introduced, however. Speaking on RTÉ's Prime Time, Mr Lenihan also defended the reduction of the minimum wage saying it would counteract the black market for unemployment in which people agree to work for less. 20.28 The Irish Nurses and Midwives Organisation (INMO) has said the four-year plan was a further, sustained, attack upon ordinary working families and upon essential public services like healthcare. The union maintained a quality assured health service should be an absolute priority in any civilised society. INMO General Secretary Liam Doran said: 'Despite all of the warnings this plan increases the very real risk of turning the current recession into a prolonged depression. 19.07 Shares in the Irish banks, which suffered heavy falls this morning, rebounded this afternoon following the publication of the four year plan. AIB finished in positive territory, while in Dublin the ISEQ index of Irish shares was up 0.5%. 18.31 Taoiseach Brian Cowen said our standard of living has fallen by over 15% since this crisis began. He said he believes the plan will be acceptable to the people with whom we are dealing. 18.28 The Irish Primary Principals Network (IPPN) said will be impossible to deliver the current standard of education provision with the scale of these cut-backs. It said it is bitterly disappointed with the 5% cut in school funding, but said the most disturbing cuts are within the range of specialist teachers (English as a second language, resource teachers for travellers, visiting teachers for children with specific disabilities and other co-ordination posts). 18.25 The Taoiseach is live on Six One in the next few minutes. Watch live here. 18. 22 Under the plan, the Social Welfare budget is to be reduced significantly, with details to be announced on 7 December. St Vincent De Paul said many people have been struggling with the basics – putting food on the table, heating and lighting – and with less money in the household budget for the poorest people, that means greater pressure for them. 18.15 Fergal Bowers, RTÉ Health Correspondent, said of the €1.4bn in Health cuts, €750m will come out next year. 18.09 Social Justice Ireland said the plan is bad for the economy, bad for society and bad for social cohesion. 18.06 Watch an extended Six One News live now. 17:59: The Irish Congress of Trade Unions has described the plan as 'savage and regressive'. ICTU General Secretary David Begg said the plan will 'do precisely the opposite of what it is supposed to do. 17:43: Cliff Taylor, Editor of the Sunday Business Post, says he expected to see more cuts in the wages of politicians and semi-State workers. 17:32: Gary Murphy, Senior Lecturer in Government at Dublin City University, says Fianna Fáil electing a new leader would not pull the wool over the eyes of the electorate ahead of the General Election. 17:28: The Irish Small & Medium Enterprises Association has given a guarded welcome to the four-year plan. ISME said the document is a 'mixed bag', with some good proposals, others not so good, interspersed with rehashed and reheated policies. 17:25: Taoiseach Brian Cowen will appear on RTÉ's extended Six-One this evening. 17:18: Commuters could face increased charges for public transport or reduced levels of service, as well as a deterioration in road conditions, as a result of measures announced in the plan. It is proposed that the public transport companies such as Bus Éireann, Dublin Bus and Iarnród Éireann will see a cut in their allocation from the Deptartment of Transport next year. Together with rationalisation and savings, this cut will amount to €10m. Regional airports will also be hit with a cut of €5.5m in their allocation. And it is likely the country's roads will get worse, with severe reductions in the Budget for maintenance. Next year the roads budget will be cut by €9m, with the promise of more cuts in the years ahead. The Road Safety Authority will also be hit with a cut of €5m in its budget and a promise that if it cannot make that level of saving, it can increase fees. As well as cuts to a variety of agricultural programmes, funding the horse and greyhound industries are also likely to change with the pledge that ‘an alternative funding model’ will be introduced. The community sector will also be hit with a cut of €8.7m in the budget allocation for next year. The Department of Education and Skills is asking its 'education partners' for suggestions on how further cuts can be made. Reduced spending on consumer affairs and cuts in the budget for the Health & Safety Authority have also been outlined today in the budget for the Department of Enterprise, Trade & Innovation. Local authorities will also be badly hit with a cut of €62m in their budgets next year as a result of reductions from the Department of Environment, Heritage and Local Government. This will be made up by the introduction of water and other charges. Overseas Aid is to be severely hit with €35m going from the budget next year, with more to come in the subsequent years. From next year, the over 65s will have to pay for a passport, a development which the Department of Foreign Affairs believes will raise around €2.3m. 17:09: Traveller and newcomer schoolchildren are to lose their special teaching resources under the four-year plan. 1,200 teaching posts are to be cut. They include the withdrawal of Resource Teachers for Traveller children as well as Visiting Teachers for Travellers. There will also be a phased reduction in numbers of Language Support Teachers. An additional 150 teachers promised under the Revised Programme for Government are also to be deferred. These and some other teacher reduction measures will yield a saving of 98 million per year when fully implemented. Teachers currently in these roles will be redeployed. The pupil to teacher ratio (class size) will remain as it is for next year. But it will increase after that unless the teacher unions can come up with other savings. The Government has not said the extent of savings it will look for under this measure. 17:07: Older people are to face charges for community health support services, based on their income, under a new scheme similar to the Fair Deal Nursing Home System. Eamon Timmins of Age Action Ireland said that older people will now have to pay for services like home help, home care packages and day care services. 17:02: Fine Gael leader Enda Kenny has said he has received conformation from the European Commission that any incoming government will not be bound by individual proposals in the four-year plan. He said it would be possible for a new government to negotiate a new plan. Mr Kenny said Fine Gael will publish its own budgetary strategy next week. Fine Gael Finance Spokesperson Michael Noonan said there was no mention on banking, which he said was extraordinary. He said once banking plans were agreed with the IMF and EU, the top-line figures in the plan would change. 16:57: The Association of Secondary Teachers Ireland has slammed the 'disgraceful' decision to cut 10% from the pay of new entrants to the Public Service. In a statement, ASTI General Secretary Pat King said: ‘This amounts to a disgraceful attack on vulnerable young teacher graduates. ‘Currently approximately 95% of second -evel teacher graduates spend up to seven years in part-time and temporary teaching positions before they can secure a proper job and income from teaching. This means that many young teachers are on the poverty line. 16:52: The EU Commissioner for Economic and Monetary Affairs, Olli Rehn, has welcomed the Government's four-year plan as a ‘an important contribution to stabilising the public finances’. He said it would constitute the foundation of the EU/IMF programme currently being negotiated between the Irish Government, the ECB, the European Commission and the IMF, which he hoped would be published by the end of the month. Mr Rehn said he was following very closely the movements in the bond markets, but said the Irish situation was very different from that of Portugal and Spain. ‘In Ireland it is a very fundamental problem with the nervous system of the whole national economy, the banking sector. Therefore one of the core issues to be dealt with is the restructuring of the banking sector,’ he said. 16:38: Irish banking shares have rallied slightly in late trading after sharp falls this morning. A short time ago, shares in AIB were unchanged, having fallen by 15% earlier, while Bank of Ireland was down only 6%, compared with a 26% drop earlier in the day. Irish bank shares have been weak in recent days due to fears that the State would take a bigger stake in the banks. World stock markets improved this afternoon due to better economic figures from the United States. 16:37: Finance Minister Brian Lenihan said the plan was a rational and sensible route out of ‘the steep downturn’. Mr Lenihan said the plan would have to be the basis for any proposals in the next General Election. 16:33: Work on Dublin's Metro North is still scheduled to start in 2012, but the DART Interconnector has been postponed because of the cutbacks in the four-year plan. Transport Minister Noel Dempsey said because the DART underground project is still in its planning stage and is not ready to go ahead, there will be no money available to start before 2014. LUAS projects such as the BXD - the city centre link - as well as extensions to Lucan and Bray will also not go ahead during the lifetime of the present programme. Road projects due to start next year will go ahead, but the Minister said there will be no major road schemes starting in 2012 or 2013. He said there would be a further review before consideration of phase two of the Western Rail Corridor. 16:29: Click here to read a Department-by-Department breakdown of the cuts to be implemented. 16:26: Labour’s Finance Spokesperson Joan Burton said the plan was the bill for 13 years of what she called Fianna Fáil mismanagement of the economy. She said the details indicated a ‘hard landing’ for people in the PAYE sector. Deputy Burton said the big problem with the plan was the lack of any real strategy for growth. She called on the Government clarify if the plan was its opening position for talks with the IMF. Ms Burton conceded that if the plan was agreed with the IMF, it could not be changed by any new government without negotiation. 16:20: Shiela Nunan, General Secretary of the Irish National Teachers' Organisation, said the 10% pay cut for new entrants going into the Public Service will create a two-tier workforce. 16:05: The Construction Industry Federation has criticised the four-year plan, saying that the ‘Public Capital Investment Programme will bear a disproportionate burden of the total fiscal adjustment’. CIF Director General Tom Parlon said: ‘The cost of cutting capital investment by this magnitude will include over 50,000 job losses, which will clearly impact Exchequer revenues through lost taxes and spending and increased social welfare payments. 15:58: Fine Gael's Enterprise Spokesman Richard Bruton said he was concerned that the Government had not put measures in place to protect the taxpayer as the banking crisis continues to unwind. Labour's Finance Spokesperson Joan Burton said she is concerned that pensioners’ payments will be reduced as part of the plan. Speaking on RTÉ Televison, SIPTU General President Jack O'Connor criticised the plan, saying it was an intensification of measures that have already failed. 15:54: Schemes and programmes which are no longer affordable in the areas of health and education will have to be closed, or in some cases fees will be introduced. The Government’s plan says this is a more cost-effective approach to service delivery compared to a programme of reducing programme benefits but retaining existing staff. 15:49: Visual Artists Ireland has criticised the plan to cap the artists’ tax exemption at €40,000. The group said that for many artists, poverty is a reality and that while the Government says the arts are at the core of our cultural identity, artists must have the ability to survive. Many artists rely on other jobs as a source of income, traditionally in the arts or education sectors. However these jobs will also be affected by cuts, the group has claimed. 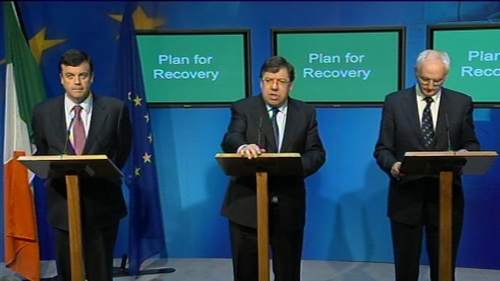 15:46: During his launch of the plan, Taoiseach Brian Cowen said the State would take some steps back to go forward again. Mr Cowen said those who can pay the most will do so, but no group will be sheltered. 15:44: IMPACT has reacted to the plan by calling for a massive turnout at ICTU's national rally on Saturday to demonstrate support for an alternative to the plan and the forthcoming Budget. IMPACT General Secretary Shay Cody said Ireland needed an alternative approach that put jobs and economic stimulation at the centre of economic policy. ‘The measures outlined today are driven by the obsession with bailing out zombie banks rather than the need to stimulate economic activity to create jobs, get us out of recession, and get the public finances back in balance,’ Mr Cody said. 15:31: The Teachers’ Union of Ireland has said it is ‘gravely concerned’ by the plan to reduce teacher numbers 'by a combination of measures' in 2011. TUI General Secretary Peter MacMenamin said: ‘Many schools are already struggling to remain operational due to staffing and middle management cuts. ‘In addition, this would sound the death knell for the promotion of science and maths subjects in our schools. 15:22: RGDATA, the independent family grocers association, has welcomed the ‘overdue’ commitment in the plan for a review of the Joint Labour Committee Wage-Setting Mechanism within the next three months. ‘We welcome this commitment in the four-year plan to address this antiquated wage-setting mechanism which is certainly a barrier to employment and does not facilitate employment growth,’ RGDATA said in a statement. 15:20: All the restrictions on trained family doctors who wish to treat Medical Card patients are to be abolished. The plan provides for competition in the medical and other professions to be overseen by an independent figure, reporting regularly to Government. 15:17: Sinn Féin TD Caoimhghín Ó Caoláin has said the Government has no right to impose ‘this savage plan’, and has called for an immediate General Election. Mr Ó Caoláin said: ‘This is a savage plan which will force the mass of the people – but especially the low paid and those on social welfare – to pay dearly for the economic treason committed by the Fianna Fáil-Green Government. 15:13: Irish Farmers' Association President John Bryan said the role that agriculture and the food sector can play in the economic recovery of the country has been acknowledged in the plan. Mr Bryan said agri-foods exports will increase by €750m, or 12%, this year and the potential identified in Food Harvest 2020 Report will continue to drive export growth and jobs. 15:06: Minister for Tourism, Culture & Sport Mary Hanafin has said over €360m will be spent on capital projects across those areas over the next four years. In a statement, she said the funding will be used for the upgrading of tourist attractions, to support investment in the film and audio visual sector and to meet the commitments of capital programmes. Minister Hanafin said the adjustments in allocations for the three sectors are proportionate and measured. The savings in 2011 will be €17m and over the lifetime of the plan the Tourism, Culture and Sport areas will contribute savings of €76m in current expenditure. The refurbishment of the Historic Wings of the National Gallery, the upgrade of the Irish Museum of Modern Art and the upgrade of the National Museum will be completed. The digitisation programmes of key historic papers and collections will continue. 15:01: Business lobby group IBEC has said that the four-year plan has ‘recognised the importance of a growth strategy for the Irish economy'. 14:55: Existing Public Service pensioners will have their pensions reduced by an average of 4%. This will save €100m in 2011. New legislation will be brought in to give effect to these changes. These pensioners were not hit by the pension levy. New entrants to the Public Service from 2011 face major changes to their pensions which will be linked to career earnings, rather than final salary, and also linked to the consumer price index. New legislation will be brought in to implement these changes. 14:51: Funding for TV licences for pensioners will be frozen at 2010 levels for the next four years. 14:49: Income tax relief for trade union subscriptions will be abolished next year. 14:48: The base for capital gains and acquisition tax is to be broadened and the level of reliefs and exemptions for these taxes reduced. 14:46: €110m is to be raised next year through excise duty changes. 14:45: The press conference has now ended. 14:45: There will be no change to the plans to phase out Mortgage Interest Relief by 2017. There will be the phased abolition of legacy capital tax reliefs (in line with Programme for Government) over the four years. Income tax relief for rent paid on private rented accommodation is to be abolished on a phased basis from 2011. Six more tax reliefs are to be curtailed, including the artists’ exemption. 14:40: The plan says staff numbers in the public sector will be reduced by 24,750 (that is between 2008-2014). Almost 12,000 staff reductions have already been made. 13,200 is the number of staff reductions that will be made between now and 2014, at an average of 3,300 per year. 14:35: The plan says planned capital investment must be reduced over the medium term. Annual public capital allocations over the period of the plan will be progressively reduced to reach an annual reduction of €3bn by 2013. Investment will focus on the smart economy, enterprise development agencies, water services investment, strategic transport infrastructures, education, energy efficiency; health, housing and tourism. 14:33: The plan includes the following specific education cuts to be implemented in 2011. A 5% reduction in all capitation grants (core payments per pupil) to schools and other programmes such as Youthreach and Adult Literacy programmes. Student fees will be increased to €2,000 (from €1,600). A €200 charge will be introduced for Post-Leaving Certificate students. Unspecified cuts will be made in student grants to yield a total saving of €51m in 2011. The non-pay grant to third level colleges will be cut by 5%. The number of Educational Psychologists will be capped at 178. Teacher numbers will be reduced by ‘a combination of measures’. There is a 10% salary reduction for new entrants to teaching (as with all entrants to public service). The plan warns that class sizes will be increased if the Department of Education, in consultation with the education partners, cannot identify alternative measures to achieve what it says is an essential reduction in teacher payroll costs. Capital spending in education has been prioritised. The plan cites demographic pressures for this. (The school-going population is growing dramatically and is set to continue to do so). 14:29: The public sector pay bill will be reduced by €1.2bn by 2014. Staff numbers across the public sector will fall by 3,300 per year, until 2014. The health sector will see the biggest reduction in staff numbers, as over 6,000 jobs will go between now and 2014. Garda numbers will reduce by 1,500 between now and 2014. The four-year plan includes the ‘full implementation of the Croke Park Agreement’. 14:27: The Government has pledged to announce details of changes to how Budgets are drawn up. This will be announced along with the 2011 Budget on 7 December. It will include multi-annual spending projections and increased EU surveillance measures. 14:25: The National Recovery Plan will, with almost immediate effect, reduce the minimum wage €1 an hour to €7.65. The existing Student Services Charge will be replaced by a flat student contribution of €2,000. A reduction in teacher numbers will save €24m next year. New entrants into the public sector, like teachers or nurses will enter on wages reduced by 10%. A property tax will be in place for 2012 and water meters are to be installed nationwide next year, with charges being imposed thereafter. The income tax threshold will fall to just over €15,000, meaning a lot of people earning relatively small wages will now fall into the income tax bracket. 40% of the measures included in this document will be delivered next year. 14:23: The price of carbon will be doubled to €30 per tonne over four years, yielding €330m. It will increase by €10 per tonne in 2012 and a further €5 in 2014. 14:21: Exchequer funding for TG4 is to be reduced with the shortfall made up from the RTÉ licence fee income, yielding a net programme saving of €6.2m in 2011. In total, the Department of Communications, Energy and Natural Resources is to contribute savings of €20m by 2014. The area of Tourism, Culture and Sport will contribute savings of €76m by 2014. In 2011, there will be a reduction of €5m in tourism expenditure, €3m in funding to sporting bodies and agencies and €5m in reduced allocations to cultural institutions and cultural projects. The artists' exemption from Income Tax is to be restricted to the first €40,000 in earnings. 14:20 Two-thirds of the adjustment over the four years will come from spending amounting to a €10bn cut. €7bn of this will come from current spending, while €3bn will come from capital. For 2011, €4bn of the adjustment will come from spending - €2.1bn from capital and €1.8bn from current. Reductions will come from the public service pay and pensions bill, social welfare and Programme for Government expenditure. 14:19 SIPTU General President Jack O'Connor has called the plan a roadmap to the Stone Age and a declaration of war on low-income earners. 14:18: Health spending is to be cut by over €1.4bn over the term of the four-year plan. Next year, the cut will be €746m, to be achieved through reduced spending on demand-led schemes like the Medical Card Scheme and Drugs Payment Scheme, the cost of drugs and medical equipment, non-core pay and savings from the HSE's early retirement and voluntary redundancy scheme. Charges for private hospital beds will also be increased, which is likely to push up the cost of private health insurance. Professional fees for GPs, dentists and pharmacists are to be cut, and the pay for all newly-appointed consultants, doctors, nurses and all HSE staff will be reduced by 10%. HSE staff numbers will be reduced by around 1,500 each year over the term of the plan, through natural wastage. There will be changes to the range of dental services and a new graded level of support under community health schemes, based on income levels. Capital spending in health will be €400m next year. 14:15: It is intended to increase the standard rate of VAT from 21% to 22% in 2013, with a further increase to 23% in 2014. The VAT measures will increase yield by €620m in a full year. The lower rate on labour intensive services will be left unchanged as any increase could harm employment. The Government will also examine further rebalancing of three VAT systems and zero rate VAT items, within the context of wider and ongoing EU level. 14:07: The Government will maintain the 12.5% rate of corporation tax. The plan places two-thirds of the required adjustment on expenditure, €10bn, and one-third on extra revenue, principally through taxation. It says the numbers of people paying tax must increase, but that an income tax system where more than 45% of tax units pay no income tax is not sustainable. The measures in the plan will be the equivalent of a reduction of 16.5% in the value of the credits and bands. It will rebase the income tax system at approximately 2006 levels. 14.00: The Government strategy aims to make savings of €15bn over the next four years, with a €10bn cut in public expenditure and a €5bn increase in taxes. It said that 40% of the measures (€6bn) will be frontloaded in the Budget, which will be delivered on 7 December. More than 24,000 jobs will be cut in the public sector over the four-year period. The public sector pay bill will be reduced by €1.2bn and pay for new entrants will be reduced by 10%. While public services retirees face significant cuts in their pensions. 13.40 RTÉ will have extensive coverage of the announcement of the Government's four-year plan. An RTÉ News Special begins on RTÉ One Television at 2pm, the Six One will be extended, and Prime Time has a special programme from 9.35pm. On Radio, coverage will begin with an extended News At One and continue on Drivetime. 13.34 Shares in AIB are down over 15%, Bank of Ireland has lost 26% and Irish Life and Permanent was 18% weaker before lunchtime. The Dublin market is down over 0.5%. Bank shares have endured weakness since the arrival of the EU/IMF team last Thursday and drops of 20% or more have been seen every day so far this week. 12.27 Brian Cowen has left the Dáil chamber to take an important phone call. The Tánaiste has taken over the Order of Business. 12.24: The Taoiseach has said he has not divested any authority to anyone and does not intend to step down after the Budget as Seán Power suggested this morning. 12.21: The Taoiseach has told the Dáil that the Social Welfare Bill is expected to be enacted before Christmas. He also said the Government does have a mandate, contrary to what FG leader Enda Kenny thinks. 12.10: The Government has defeated the Opposition on the vote on today's Order of Business. 11.45: Sinn Féin's Caoimhghín Ó Caoláin said he would not agree to the Order of Business because the Government refused to allow for debate and a vote on the four-year plan. 11.10: Brian Cowen said the Labour banking policy was precisely what he would call a bum steer. He said the European institutions were not coming to Ireland to tell the Government to build on policies of the Labour party. They were advising them to build on the Government's policies. 11.05: Labour leader Eamon Gilmore criticised the manner in which incremental information was coming from the Taoiseach. He accused Mr Cowen of giving the country a 'bum steer' on the banks. 11.00: The Taoiseach said it would be wrong for him to pre-empt the outcome of talks with the IMF and European institutions. 10.57: The Government will release details of the plan to save €15bn at 2pm. Details of the plan will be posted on www.budget.gov.ie. 10.44: Labour leader Eamon Gilmore described the EU/IMF facility as 'one hell of an overdraft'. He asked the Taoiseach how much it was going to cost and what the interest rate would be. 10:39: The Taoiseach said negotiations were continuing on a facility and he said the €85bn figure was being discussed. He said the final figure had not been decided, but would not be a 'three figure' sum. He said it was not intended to draw down all the funds describing it as an overdraft. 10.35: The Taoiseach has rejected suggestions by Enda Kenny that the loan facility from the EU and IMF will be more expensive for the taxpayer because the Taoiseach ignored his suggestion to bring the budget forward to next week. Brian Cowen said if there was a General Election and the Budget was delayed until January the situation would be more difficult. 10.25: Irish banking shares fell heavily in Dublin this morning. Shares in AIB were down almost 15% to 28c, while Bank of Ireland was down 23% to 23c. Irish Life and Permanent was also almost 15% lower at 65c.